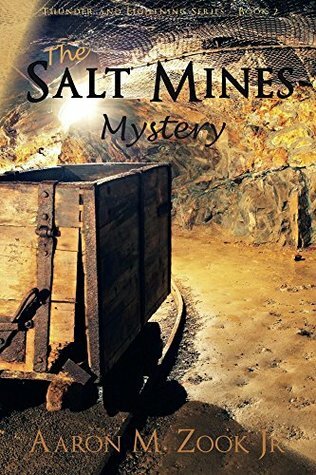 The Salt Mines Mystery by Aaron M. Zook Jr.
We’d love your help. Let us know what’s wrong with this preview of The Salt Mines Mystery by Aaron M. Zook Jr.. Preview — The Salt Mines Mystery by Aaron M. Zook Jr.
Twelve year-old Gabe Zanadu, his brother, Alex, and dogs Thunder and Lightning face Team Test #2 in Germany’s Berchtesgaden Salt Mines. Fighting a human-trafficking ring, they must successfully negotiate the Egyptian Path of Death to free themselves, the victims and bring their captors to justice. Threatened in the streets of Goeppingen, Germany, Gab Twelve year-old Gabe Zanadu, his brother, Alex, and dogs Thunder and Lightning face Team Test #2 in Germany’s Berchtesgaden Salt Mines. Fighting a human-trafficking ring, they must successfully negotiate the Egyptian Path of Death to free themselves, the victims and bring their captors to justice. Threatened in the streets of Goeppingen, Germany, Gabe and Alex Zanadu make a disastrous decision that plummets them, their dogs Thunder and Lightning, and international friends into the clutches of an evil human trafficking ring. Who sent thugs to attack twelve-year-old Gabe in an alley? What secret does Gabe and Alex, his fourteen-year-old brother, learn at the War Council? Can the boys remember the sailor song clues given by the mysterious ‘G’ and survive? How do Thunder and Lightning keep their masters alive? Will Gabe and Alex’s brotherly ties withstand the onslaught of danger? Who will finish the race through the Egyptian Path of Death? To ask other readers questions about The Salt Mines Mystery, please sign up. Interested in mines and found this book interesting as a bunch of kids get together and combine the clues they've received or found. They are trying to find the missing exploited children who've gone lost in the salt mines in Germany. Love the descriptions of the area and wish I could visit someday. This appears to be a series book but I've not read the first one and it's easy to follow along without having read the first. The kids fathers all work on sec The Salt Mines Mystery by Aaron M. Zook Jr. This appears to be a series book but I've not read the first one and it's easy to follow along without having read the first. The kids fathers all work on secret projects and the kids receive notes and do go on excursions to the castle and salt mines. Fast paced action as the train they were riding in did not go the same route as others and they meet with enemies that want to harm them-as they will get paid anyways. And Indiana Jones and God all combined for a team that may prove to be unbeatable. Their next assignment is included in the form of a riddle. Non-stop action and heart stopping thrills abound in The Salt Mines Mystery, Book 2 in the Thunder and Lightning series by Aaron Zook. Gabe and Alex Zanadu, ages 12 and 14, are fresh from their escape from kidnappers in The Secrets of the Castle and are looking forward to their family vacation where they will get to tour the salt mines of Berchtesgaden. Arriving to find six of their international friends also preparing to take the tour, the boys cajole their parents into letting them tour the mi Non-stop action and heart stopping thrills abound in The Salt Mines Mystery, Book 2 in the Thunder and Lightning series by Aaron Zook. Gabe and Alex Zanadu, ages 12 and 14, are fresh from their escape from kidnappers in The Secrets of the Castle and are looking forward to their family vacation where they will get to tour the salt mines of Berchtesgaden. Arriving to find six of their international friends also preparing to take the tour, the boys cajole their parents into letting them tour the mines with their friends. This disastrous decision separates the group from the adults and places them directly into the crosshairs of an international human trafficking ring. Can the boys and their dogs lead their group out of the salt mine maze? Will all of them survive the many booby traps set up to keep them in the cartel’s clutches? I love the adventure in this series. Told from the POV of Gabe, you get the idea that he’s a bit of a hothead who believes his skills make him smarter and more invincible than the average villain. Nothing scares him although many things SHOULD! I also love that Gabe and Alex are not afraid to give God credit for their safety, even when their friends believe it’s just dumb luck. I wasn't impressed with Gabe on the whole. He still seems like a bratty little brother who knows better than even his parents in nearly every situation they find themselves part of. Fair warning: Neither the boys nor their dogs come out of this one unscathed. Several of their friends are injured as well. Beware: Once you start this book it does nothing but pick up steam until the screaming finish! You will NOT be able to put it down until you find out if they got out of the next mess they found themselves in. This book was definitely reminiscent of Indiana Jones and the Last Crusade. (Pretty sure that’s the one where Indy’s father gave him a poem to help him through the chamber to where the chalices were.) In The Salt Mines Mystery, the boys have a song memorized that comes in handy. You’ll have to read it to find out! After reading book one and enjoying it, I decided to try book two. My son also read book one and was looking forward to reading the second in the series. We home-school, so that is fun common ground with the boys in the series, and my kids once had dogs named Thunder and Lightning. This book continues the family's military time in Germany, and they end up at the Salt Mines on a field trip/ family getaway. Somehow, all their friends end up there too, which makes the story all the more exciting. W After reading book one and enjoying it, I decided to try book two. My son also read book one and was looking forward to reading the second in the series. We home-school, so that is fun common ground with the boys in the series, and my kids once had dogs named Thunder and Lightning. This book continues the family's military time in Germany, and they end up at the Salt Mines on a field trip/ family getaway. Somehow, all their friends end up there too, which makes the story all the more exciting. What kid doesn't want to travel with his peers? Alex and Gabe have alot of sibling rivalry going on, and are always pushing the boundaries to the limit and getting in trouble, especially Gabe. It took me a little while to get the hang of who's who, and everyone's name and relationship straight with the friends, but that was just a minor hangup for me. Their adventures begin almost immediately and they go from risky, to perilous to flat out dangerous in a matter of just a few hours. The menacing people after them, and the high-risk things they have to do to get out of the mess they are in is almost unbelievable. But for boys, I am sure it is exciting and unpredictable. There are some pretty freaky moments, injuries, and I would say this book is not for the faint of heart, or the squeamish. . I know there were several times, my son was on the edge just wondering what was going to happen next! And how in the world they would get out of that particular predicament alive. I think these are great adventure books for tween boys. They include mystery, suspense, adventure but also loyalty to family and friends and well as life lessons in obedience, faith, and trusting God. Some parts may be a bit frightening, so you should judge based on what you feel your child can handle. I am sure some girls may enjoy these books also, as the boys have friends who are girls in the books. The Salt Mines Mystery by author Aaron M. Zook, Jr. is the second book in his Thunder and Lightening Series preceded by The Secrets of the Castle, Book One. These adventurous mystery tales are for tween boys but I'm sure some girls will enjoy them, also. It is a 278 page paperback book picturing an old mine on the front cover. This book takes us on a journey into the salt mines of Germany. Alex and Gabe's father works on top secret projects for the government. These secret projects are valuable a The Salt Mines Mystery by author Aaron M. Zook, Jr. is the second book in his Thunder and Lightening Series preceded by The Secrets of the Castle, Book One. These adventurous mystery tales are for tween boys but I'm sure some girls will enjoy them, also. It is a 278 page paperback book picturing an old mine on the front cover. This book takes us on a journey into the salt mines of Germany. Alex and Gabe's father works on top secret projects for the government. These secret projects are valuable and very wanted making them hazardous to possess. The boys' family realize they are in danger and decide to get away. This is the tale of that life changing adventure. It is filled with drama, intrigue, suspense, mystery, and action. There is inspiration, too, as the boys pray for God's guidance and protection. They must learn to trust in Him and have faith. It touches on other things but just lightly. The author has a nice writing style. His plot is well thought and organized. The characters, and there are a lot of them, are well defined. Boys will love and relate to this new group of friends. Gearing the book toward boys there are a few scenes of danger and injury. Boys seem to like that tough stuff more than girls do. This book contains much more mystery, intrigue and danger than the first one did. They end up underground trying to stay alive as a well run kidnapping ring tries to capture or kill Gabe, Alex, and their friends. Their trained dogs Thunder and Lightning go through quite a nightmare as well, but they are a great help to Alex and Gabe. This is told from Gabe's POV. They are given a clue rhyme before they start. They try to remember it as they make their way through the mine. I like that they pray, This book contains much more mystery, intrigue and danger than the first one did. They end up underground trying to stay alive as a well run kidnapping ring tries to capture or kill Gabe, Alex, and their friends. Their trained dogs Thunder and Lightning go through quite a nightmare as well, but they are a great help to Alex and Gabe. This is told from Gabe's POV. They are given a clue rhyme before they start. They try to remember it as they make their way through the mine. I like that they pray, and that they trust God will protect them as they go through many treacherous obstacles. Unlike the first one, some die in this read. There is also a bit more violence, danger, and wounds in this one...broken leg, burned and blistered feet, concussions, etc. I'm mentioning these because it may affect the age group to which this book appeals. I'm pretty sure, once again, that my daughter is going to be engrossed in this read as she was the first. She loves Hardy boys books, but she did enjoy the first Thunder and Lightning book better than Hardy Boys. Although some of the book is rather unrealistic, I did enjoy the read. I'm very interested in getting my daughter's opinion on this read. I highly recommend this one as clean reads for younger ages are difficult to find. This is the second book in the Thunder and lightening series by Aaron M Zook Jr. I fell in love with the fast paced action and suspense in this book. I know it is a book for young adults but this series rocks even for grown ups! Kinda makes me feel like a kid again reading all the Hardy Boys and Nancy Drew adventures. These books are that great! This book leads us into the salt mines in Germany after an incident makes the family realize they are in danger and go away on vacation. Alex and Gabe's This is the second book in the Thunder and lightening series by Aaron M Zook Jr. I fell in love with the fast paced action and suspense in this book. I know it is a book for young adults but this series rocks even for grown ups! Kinda makes me feel like a kid again reading all the Hardy Boys and Nancy Drew adventures. These books are that great! This book leads us into the salt mines in Germany after an incident makes the family realize they are in danger and go away on vacation. Alex and Gabe's dad works for the government on top secret projects that people will go to any lengths to get. They end up meeting their friends at the hotel and getting involved in an adventure that will change their lives forever. With Thunder and Lightening by their side they end up underground with their friends fighting for their lives. Everyone has to learn to work together to stay alive. They pray for God's guidance throughout this amazing book. This book will have you on the edge of your seat. Will Alex, Gabe and their friends all come out alive? Will they be able to remember a rhyme they were given earlier by G to keep them on the right track??? The Salt Mines Mystery by Aaron M Zook JR is the second book in the Thunder and Lightening Series. After fighting with the skateboard champion, Gabe takes a shortcut home and ends up in the wrong part of town and in trouble. He is saved by his older brother Alex. After their parents find out what has happened they decide the family is in danger and they go on a vacation. The family meets up with some of the father's co workers and their families at the hotel. The parents know the kids could be in The Salt Mines Mystery by Aaron M Zook JR is the second book in the Thunder and Lightening Series. After fighting with the skateboard champion, Gabe takes a shortcut home and ends up in the wrong part of town and in trouble. He is saved by his older brother Alex. After their parents find out what has happened they decide the family is in danger and they go on a vacation. The family meets up with some of the father's co workers and their families at the hotel. The parents know the kids could be in danger. But the kids do not listen to their parents. The kids get together secretly at night and talk about the danger around them. The families go on a trip to the Salt Mines and even through the kids know there is danger and the parents want them to stay with them, the kids go with their friends and end up in danger. Gabe and Alex received a note 6 months prior to this trip that contains a rhyme they are to memorize. This rhyme is what helps them out of the bind they are in. The action was non-stop. Over the top. How could a typical adult survive, let alone a 12- or 14- year old boy? This was a great follow-up to book 1 (Secrets of the Castle), and I think pre-teens as well as most parents will enjoy this book. Overall, the book was extremely entertaining and riveting. There were parts of the book I didn’t understand, but I’ve not explored caves or gone rock climbing. Also, I personally would not have let my 12- and 14-year old children explore unsupervised while on vacation in a foreign country. And my personal belief is that fourteen is too young to have a steady girlfriend, although that relationship was only in the background of the story. Brothers Gabe and Alex with their backpacks full of survival gear are off on another dangerous exploit in Aaron M. Zook's, second in the Thunder and Lightning series, The Salt Mines Mystery. And oh the trials and tribulations they find themselves in! Kidnapped by human-traffickers and imprisoned in the Salt Mines caves, they along with their friends face numerous life-threatening dangers and yet are still able to pray and give their problems to God. To escape the caves Gabe and Alex and Thunder Brothers Gabe and Alex with their backpacks full of survival gear are off on another dangerous exploit in Aaron M. Zook's, second in the Thunder and Lightning series, The Salt Mines Mystery. And oh the trials and tribulations they find themselves in! Kidnapped by human-traffickers and imprisoned in the Salt Mines caves, they along with their friends face numerous life-threatening dangers and yet are still able to pray and give their problems to God. To escape the caves Gabe and Alex and Thunder and Lightening, their canine sidekicks, must follow the Path of Death and are challenged by swinging pigs and swooshing blades, flooding rooms and snaking tentacle. Zook, with his fast-paced scenes and ongoing suspense of how in the world will they get out of this, does a great job of keeping a reader's interest from the first chapter to the last. Although there is the typical bickering amongst the kids, they quickly learn to trust each other and that faith can conquer fear. A great book for youngsters and adults too. Two boys twelve and fourteen and their dogs Thunder and Lightning go on a wild non stop action adventure full of danger, suspense and intrigue. A sailor's song with clues given by the mysterious G. Who is G? Even though geared towards young adults this book got me from the get go. I loved it. Have not read the first book in the series but have read other books by Aaron Zook and he is a marvelous and talented writer. After being kidnapped by human traffickers and imprisoned in the Salt Mines Cave Two boys twelve and fourteen and their dogs Thunder and Lightning go on a wild non stop action adventure full of danger, suspense and intrigue. A sailor's song with clues given by the mysterious G. Who is G? Even though geared towards young adults this book got me from the get go. I loved it. Have not read the first book in the series but have read other books by Aaron Zook and he is a marvelous and talented writer. After being kidnapped by human traffickers and imprisoned in the Salt Mines Caves the boys Gabe and Alex along with their dogs and friends have to travel the Path of Death where they encounter many trials and obstacles and injuries. I loved how the boys prayed and trusted God during the whole ordeal. Thunder and Lightning were fantastic and added so much to the story. I recommend this book to all ages especially if you like mystery, adventure and non stop action stories. Look forward to reading more of Mr. Zook's books. I received a free copy of this book from bookfun.org for my honest opinion and review. By Aaron M. Zook Jr.
Gabe and Alex are back with another mystery and if they can't solve it they won't live to regret their failure. The two brothers and their friends are in danger and are soon separated from their parents when touring the Berchtesgaden Salt Mines. A mysterious clue given to them by someone referred to only as G may be their only hope to escape the people hunting them within the salt mines. And this time they may have to say goodbye forever to some whom they consider friends. This book is perfect for middle grade readers - especially boys. Parents and grandparents will be happy to hear that these are clean reads. This is realistic fiction for those who are looking for something other than fantasy.